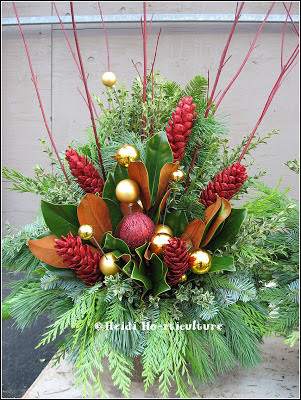 Here I made a Christmas Urn Design that is one sided. 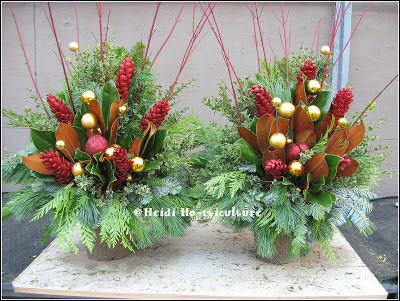 One bonus to making one sided Christmas urns: less material is needed. With this design, all the accents are on one side, making a bolder view from the front. You use less materials and yet have the effect of seeing all the accents from the street. They are easier to make and faster to assemble. Great for urns that are situated next to the front door or garage - where the containers are right up against a wall/door. Try it! All materials are available at Plant World. Hi there! I am so glad you stopped by! 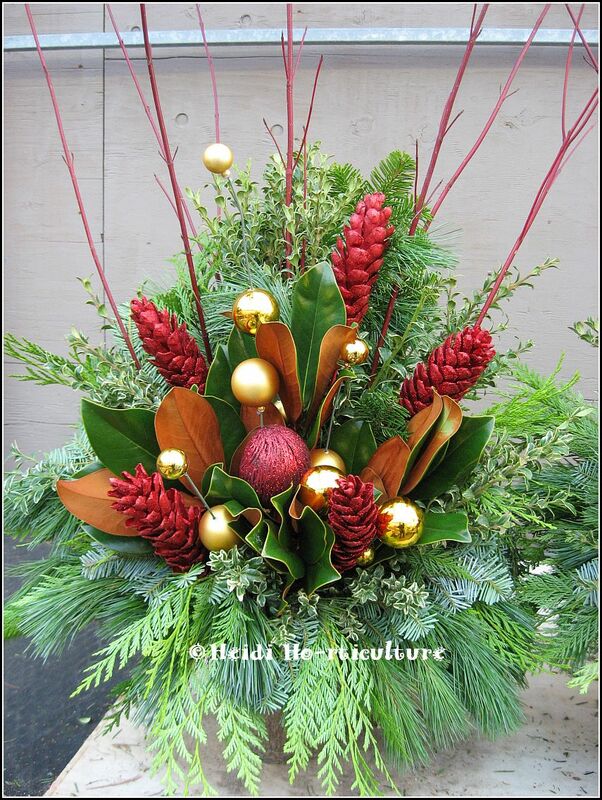 My name is Heidi and I'm a gardener from the Greater Toronto Area, Ontario, Canada. This gardening blog reflects the way God designed my creative side. I hope it demonstrates a place where fun gardening tid-bits can be shared - even if you only have a small space like mine. Enjoy! ✿ Kermi, it's time for your wormy! All outdoor plant material info pertains to a Zone 5b or 6a hardiness: Southern Ontario, Canada. ✿ No land to garden with? The internet is wonderful to search blogs, videos, books, magazines and local publications for ideas and helping you get launched for the new growing season. Not to despair! This Victorian video series is an oldie, but goodie. It will help get rid of any winter blues. Gardening journal (where you learn from mistakes and remember what you've planted year to year), an absolute essential! Over the years, I have bought many books on gardening. If you are new to gardening, the best I find are the books that are simple. To gain knowledge, I'd suggest you buy books that pertain to one element of gardening; such as flowering shrubs. If you buy the type that touch upon every aspect of gardening, you'll find they are great additions for the coffee table, as apposed to you learning a thing or two. Check your local bookstore or online for gardening books that are specific to your region. Hardiness is a HUGE factor here in Canada. No sense in buying books from the UK which has info pertaining to their climate, or ones from the west coast when you live in Southern Ontario. They may have info regarding pruning techniques and such which is helpful, but for the most part, invest your money in garden knowledge that speaks of zonal information pertaining to your region. ✿ © 2011-2017 All post photos are original (unless marked otherwise). Awesome Inc. theme. Powered by Blogger.